This week TravelSkills editor Chris McGinnis is in Spain and will be posting various dispatches from the trip in addition to our regular news and tips. 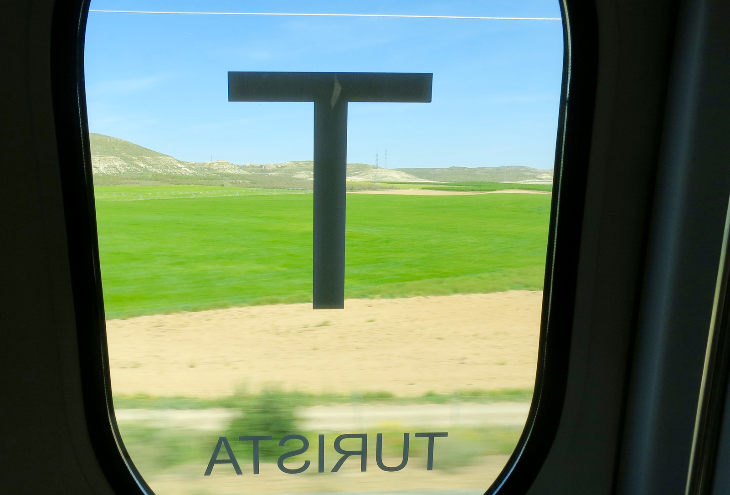 First up: Riding Spain’s high-speed AVE train between Madrid and Barcelona. 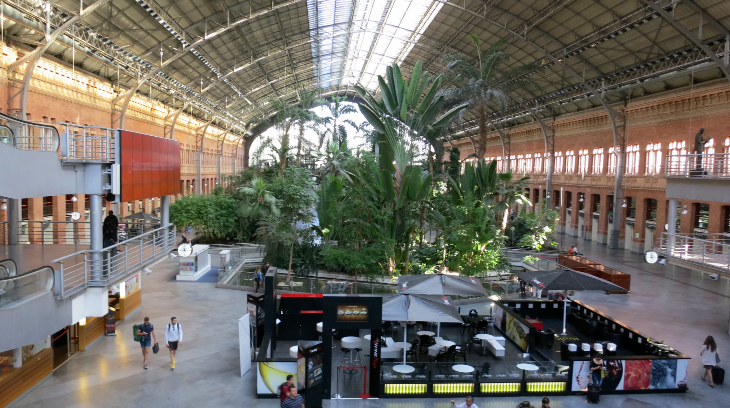 Madrid’s Atocha is a gorgeous, bright and airy space where older trains once arrived and departed. But since high speed trains now use an adjacent platform, the original station space has been transformed into an unusually lush tropical garden lobby. (see above) That’s a nice way to start a trip! Advance purchase round trip airfares start as low as about $160, but you have to factor in the time and cost of airport transfers. Plus discounts and deals vary a lot, so investigate. 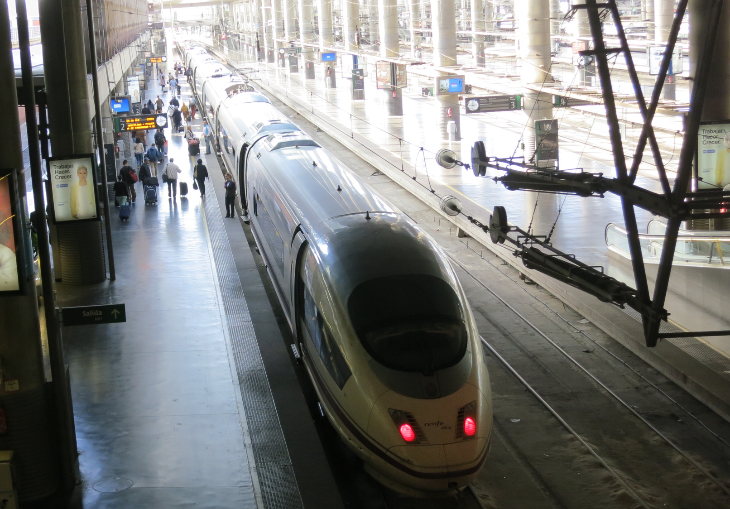 Trains depart Madrid roughly every half hour between 7:30 am and 9:00pm for the three-hour trip. Trains are remarkably clean, quiet and comfortable in tourist or first class. There is plenty of room for luggage and lavatories in every car. 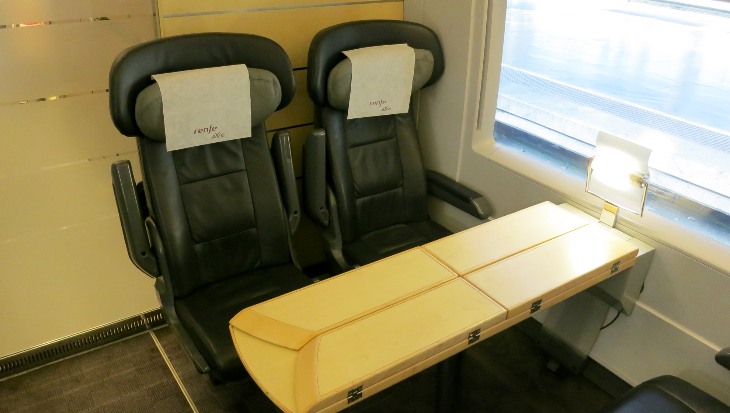 First class seats are slightly larger and three abreast, tourist class are four abreast. 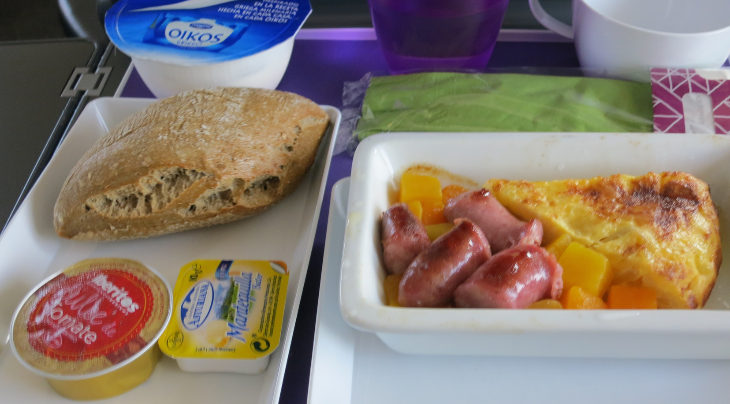 Meals are served via by attendants via a trolley in first class and there’s a bar/cafe car where tourist class passengers can purchase food or drink. Our train made three quick stops along the way. 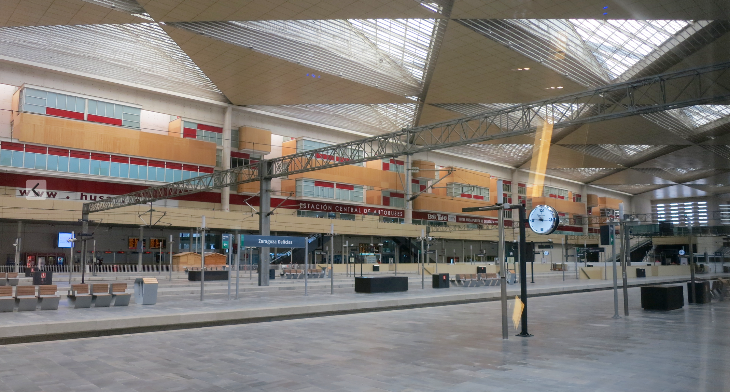 The station in Zaragoza was impressively contemporary and bright and even houses a new hotel. Spain’s rail systems is called Renfe, an acronym for Red Nacional de Ferrocarriles Espanoles, which means National Network of Spanish Locomotives. Top speeds are in the 190 mph range and the plains of Spain looked very much like New Mexico or Arizona to me. The countryside was much drier near Madrid, but greened up substantially as we approached coastal Barcelona and Catalonia. 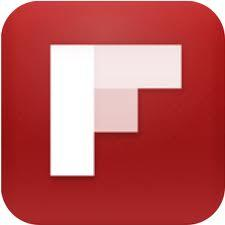 Regrettably, there is no wi-fi on the these AVE trains, which is disappointing for business travelers. However, there are several channels of music, radio and a movie (Spanish only) which you can access via a headphone jack in your seat. 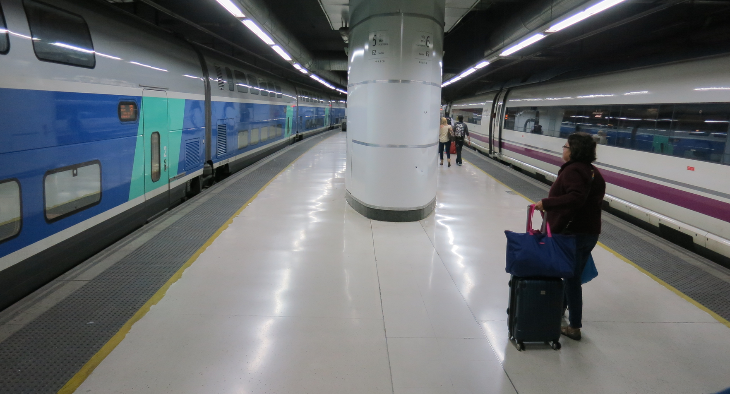 When our train arrived in Barcelona, a French TGV train was on the same platform, which meant I could have jumped off the train from Madrid and taken off for Paris in a matter of minutes. Why can’t we have a system like this in the US? 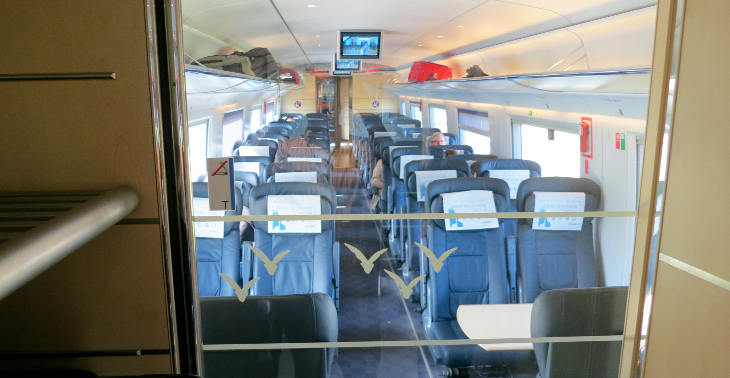 Before the train departed Atocha station, I took a sneak-peek at the conductor’s cabin at the rear of the train. Very cool! Take a look at me taking a seat in the conductor’s chair on the TravelSkills Facebook page.